Living room and upholstered furniture retailer DFS has ordered 20,000 sq ft of bespoke Transdek mezzanine floors lifts for its Glasgow distribution centre. 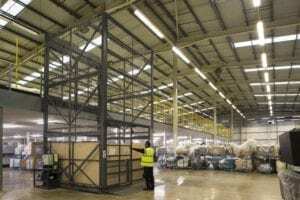 The 20,000 sq ft mezzanine level provides storage capacity for an additional 440 furniture racks, which the Transdek goods lifts provide access to. Transdek’s mezzanine lifts were designed and manufactured to meet DFS’ specific requirements. They have an enlarged three-metre by three-metre platform size suited to carrying three furniture racks to and from the secondary storage area. The lifts have a 750kg safe working load and are engineered for 24/7 heavy-duty warehouse operation. “Not only have they supplied a robust, well-engineered product at a competitive price, they also managed to deliver the lifts two weeks ahead of schedule to suit our build plans,” said DFS project manager James Brown.